.....and I know He watches me. I just love this old hymn of the faith. Have you ever heard it? It was written in 1905 and has been sung countless times in churches and cathedrals and tent revivals ever since. There's just something about the lyrics that help you to remember that if the amazing God of Heaven is watching even the little sparrows, He is surely watching over you! Don't you just love that reassurance? I sure do and I lean on it daily. There's been so much pain, and hurt and tragedy close to me and in the world lately. It hurts my heart to think of so many - maybe even you - who are dealing with so much by way of burdens and sorrow. But I know my God and He loves you and has His arms around you even when you don't feel His presence. It's my prayer that you feel His love and mercy today, right where you are. As you take a look at my card for today, I hope you're reminded that you're never alone. 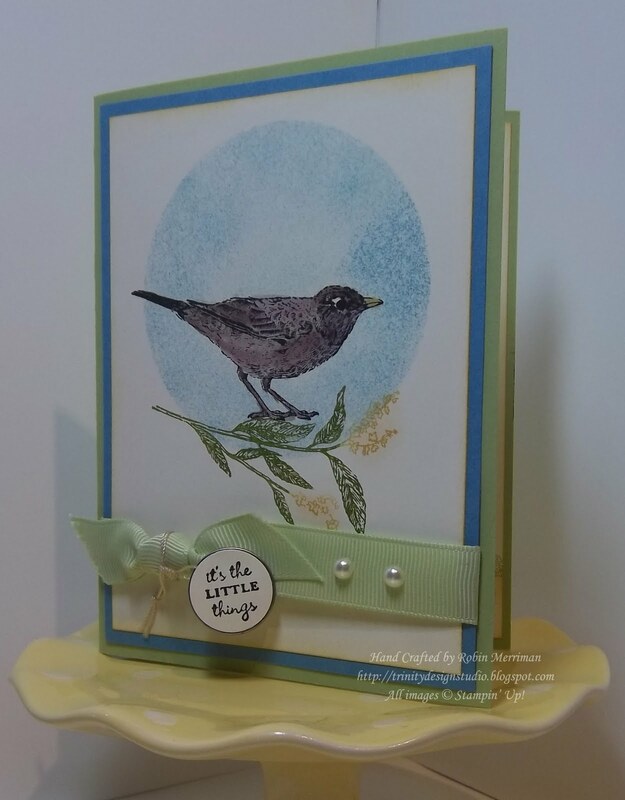 A few weeks ago, I saw this card on Julie Pitta's blog - here is the link to her original card. It was just so pretty, I had to recreate it! The main image was stamped with the Nature Walk stamp set - this is a must own set, so get it before it's gone at the end of next month. You just can't make a bad card with it. To get the Marina Mist circle background, I cut a paper mask with some scrap paper (I used an old piece of Grid Paper) and my 3" Circle Die and the Big Shot. I positioned it on the Very Vanilla cardstock and using my Stamping Sponge began to add the Marina Mist ink working into the center from the edges. Just keep adding color until you've gotten the depth you want. Next, I stamped the bird in Basic Black ink and colored him in with Early Espresso ink refill and my Aqua Painter. Again, I added color first to the darker areas of the bird, working it out gradually so I wouldn't get a dark blob where I didn't want one. 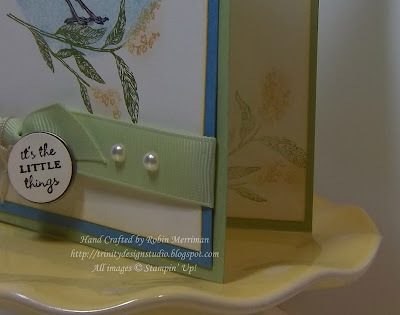 The branch stamp was colored with Old Olive and So Saffron Stampin' Write Markers and after I stamped it on the cardstock, I added some So Saffron pastel chalking to the flowers to make them pop out. It gives them a pretty, soft effect. Without reinking the stamp, I stamped it again on the inside Very Vanilla panel as well, again adding the pastel afterwards. Both of the Very Vanilla Panels were sponged with So Saffron ink. I adhered the front panel to a piece of Marina Mist cardstock then wrapped it with a piece of Certainly Celery 5/8" Grosgrain Ribbon. This whole panel was added to the Certainly Celery card base. A single knot of Certainly Celery ribbon was added to the left side, then I stamped and added the Mini Tag tied around the knot. The greeting is from the You're a Gem stamp set and I'll tell you a little secret. I tried to stamp it on the tag itself, but I messed it up, so I stamped it on scrap cardstock then punched it out with my 3/4" Circle Punch. It's attached to the tag with a Stampin' Dimensional! Proving once again that you can fix 99.9% of your mistakes in stampin'! The final touch for this card was the addition of two Pearls to the ribbon, adding just a bit of elegance. I hope you enjoyed your visit to my blog today - I love writing, posting and sharing with you all, it's really a joy for me! Today, I want to leave you with a beautiful version of the song I shared in the beginning of this post. The video is just the lyrics, so I just encourage you to push play, sit back and close your eyes and let the love of God wash over you as you listen to His heart. I just bought that set and can't wait to try this! One of my all time favorite songs too. I learned to sign this and signed it in front of an assembly at DEA to graduate from my Level 1 ASL Class. Didn't think of it when we made this card, but it makes me like the card even more. Thanks for sharing.